So it turns out that keeping a blog updated while traveling, isn't the easiest thing in the world to do! David and I are almost halfway through Month 2, so I have plenty of stories to fill you in on! We're currently in Cambodia, in a town called Sihanoukville. It's a bit like Portrush on steroids, with bars and restaurants lining the beach, and tuk-tuk drivers constantly trying to get your custom! This is just a stop-over for us to recover from the absolutely incredible island of Koh Rong Samloem and prepare for our journey to the North East of Cambodia in the next few days! Anyway, those are tales for another day! In this post I want to tell you about the 3 days we spent in Ayutthaya. 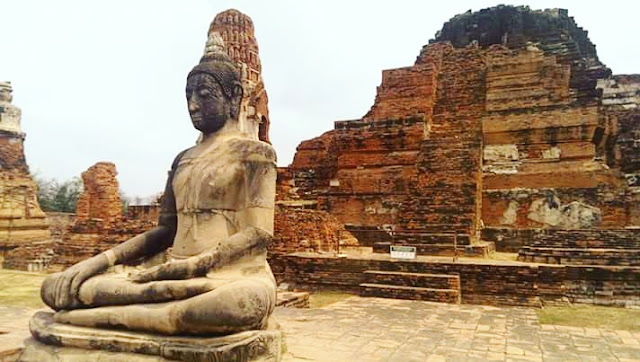 Ayutthaya is usually visited on a day trip from Bangkok with a tour group, but we decided to spend 2 nights in the ancient city so that we had plenty of time to explore the many temples and ruins that the city is now famous for. 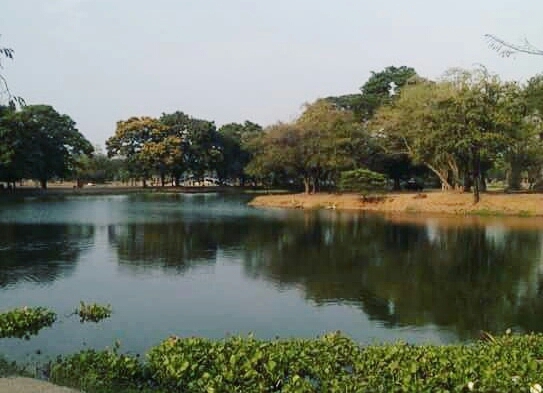 It was once a former capital of Thailand, and one of the largest and most impressive ancient cities of the world! The majority of the ruins are located on the main island of Ayutthaya, which is bordered on all sides by 3 different rivers. There are a couple of sites across the river, but for some reason David and I never managed to visit these ones! Although it is recommended to take a boat ride along the river at sunset for some spectacular views, something I kind of regret not doing! We got a local minibus from Victory Monument in Bangkok to Ayutthaya, a 3 hour journey that cost 180 Baht for both of us, so about £3.80! It wasn't the most comfortable of journeys, somehow we both got stuck on the back row shoved into the corner beside 2 other people. I legit had bruises on my knees from them being pushed into the chair in front for the whole 3 hours! The minibus would have been a completely fine way to get to Ayutthaya, despite the lack of leg room, if they hadn't pretty much taken advantage of the fact that we were so obviously foreign. This is just one of the many ways that Thais scratch each others backs. Instead of being dropped to the bus station, like very one else on the bus, the driver pulled over and told us to get out, that this was our stop. Not having been paying much attention to where we were, and conscious of the fact that we were the only non-local people on the bus, we just gathered up our things, grabbed our bags and got off. Only to quickly discover that we most certainly were not in town, and actually we were at a tuk tuk stop, on the side of what looked like a dual carriageway. As soon as we got off the minibus the tuk tuk drivers pounced, trying to bring us on a tour of the temples for 200 Baht...having just down a 3 hour journey for less than that we weren't interested! We also had our backpacks with us, so all we wanted to do was find our hostel and get our bearings before going round the temples. But the tuk tuk drivers didn't seem to understand that we only wanted to go to our hostel, nowhere else! Eventually we just walked away from them. Thankfully, on the opposite side of the road was a massive shopping centre, with signs for Starbucks so we decided to go inside, find somewhere to sit that had wifi and try to figure where we were, and how we could get into town! After a very welcome coffee break, we decided that we would try our luck by walking along the road and flagging down a taxi. As we left the shopping centre and began to walk down the road in search of a taxi, a Thai girl about my age was walking along behind us and started calling for us. She asked if we were lost, or needed help, and then proceeded to tell us that the only way into town was by taxi from the front of the shopping centre, or by tuk tuk across the road. We told her about the minibus debacle, and that the tuk tuk drivers only wanted to take us to the temples, when we only wanted to go to our hostel! She searched for our hostel on her phone, and then offered to speak with the tuk tuk drivers for us. She crossed us over the road and began talking to one of the drivers, showed him where our hostel was on her phone and negotiated a price for us (120 Baht, alot cheaper than we would have got!). We couldn't believe how nice she was, and how willing she was to help us! 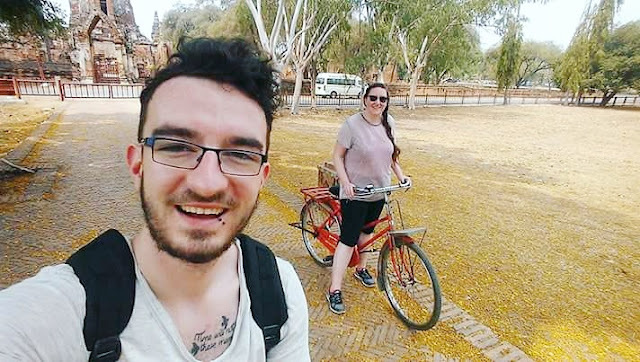 If our hostel had been close to where she lived, she was going to bring us herself, but even the fact that she spoke to the driver and made it clear that we only wanted to go to our hostel was a massive help! We were so thankful for her, I don't know what we would be done if she hadn't helped us out! After all that, we finally made it to our hostel, Hi Ayutthaya Youth Hostel. It was decent enough, a good sized room with an en suite and air con for 500 Baht a night, which is roughly about £10! The bathroom was big, with a good shower but there were alot of bugs in it. Strangely there weren't many in the bedroom itself, they seemed to stay in the bathroom which was better than nothing I guess! We didn't spend much time in this hostel, the way we did in New Joe. There was a garden area but they didn't do any food or drink, and the hostel was so quiet that it felt a bit awkward to sit outside. So we spent most of our time wandering around the town, and finding places to sit, chill out and eat instead of going back to our hostel. After we got settled in, we decided to go out for a walk around town to figure out where we were, and see what we could find. As it turned out, our hostel was quite far outside the main part of town. There wasn't much in the area, and we had to walk for about 10-15 minutes before we found any restaurants or shops, or even temples! That first day we walked for so long and so far that we were exhausted by the time we got back to the hostel that night! 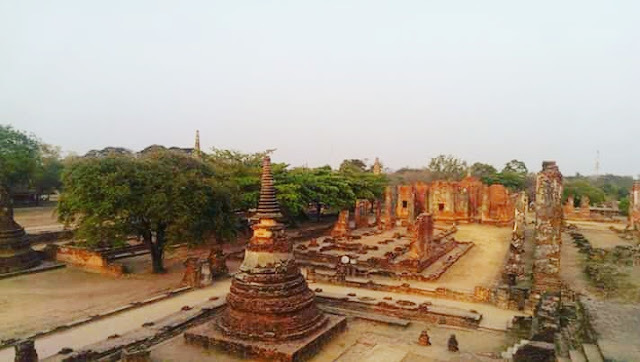 This was the first set of ruins that we visited, and the only ones we managed to see properly on Day 1 in Ayutthaya! 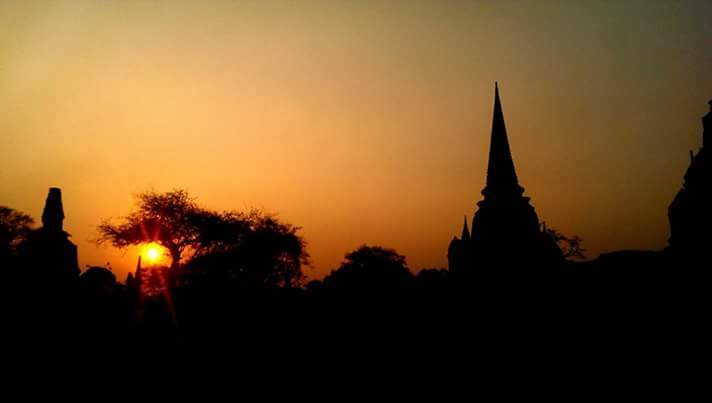 Luckily enough, we managed to catch the sunset here, in what was considered the holiest temple in the site of the old Royal Palace, first built in 1350! This temple complex has a rich history, with several different kings and rulers adding their own buildings, and reconstructing others! (For a more detailed history, look here.) 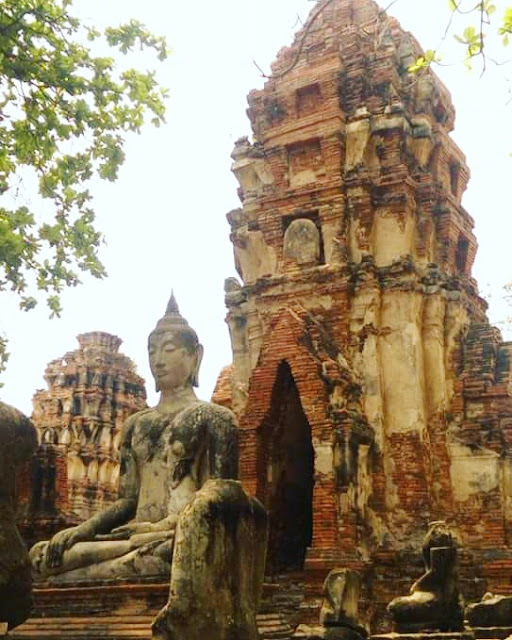 There's a 50 Baht admission fee for foreigners, which is slightly more than £1, and is a pretty standard fee across all of the ruins. It used to hold a statue of Buddha 16 meters high, standing on a pedestal 8 meters long, with a bronze core weighing almost 64 ton and coated with 343kgs of gold! Unfortunately, when the Burmese invaded Ayutthaya in April 1767, they burned Wat Phra Si Sanphet to the ground, taking with them most of the Buddha images and melting down the gold of the larger ones, including the 16m tall Buddha! We really loved getting to see the sunset here, it was a perfect end to an otherwise annoying, slightly crappy day travelling with silly bus companies! But seeing the beautiful sunset over the tops of these incredible ruins made it all worthwhile! Our second day in Ayutthaya was more productive! We rented two bikes (for cycling, motorbikes come later!) for 60 Baht each and braved the chaotic roads on wheels rather than feet! Cycling around the town was so much easier and faster than walking, it's definitely the best way to get around and see all the temples. I couldn't believe the amount of walking we did on our first day, but a bike makes all the difference! Besides, renting a bicycle for £1.20 for a full day is unbelievably cheap, how could we say no? The people we rented the bikes from were so trusting aswell, there was no deposit or passport needed, nor was there a designated time to have the bikes returned for...They just trust people to bring them back when they're finished with them! 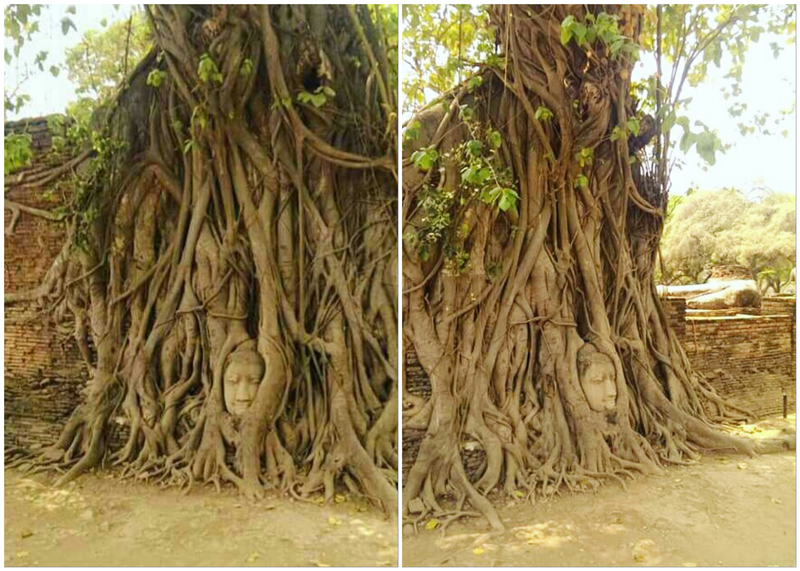 The first temple ruins we visited on this day contained one of the most recognisable images of Ayutthaya, possibly even of Thailand; a lone Buddha head being engulfed by a tree! We were really excited to see this, even if we are slightly dubious as to whether the stories are true or not! Some say that it was left behind when the Burmese invaded Ayutthaya, and others say that thieves abandoned it because it was too heavy to carry, and so it was was entwined in the roots of a tree that grew around it. Either way, the history behind the Buddha head is a mystery which makes it pretty cool to see in real life. The head is huge, and is just nestled in with the roots! I would suggest going pretty early in the morning to see this Buddha head. 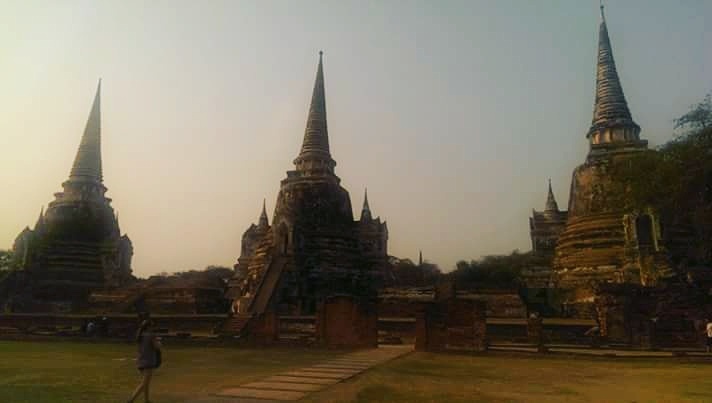 It's one of the "main tourist attractions" in Ayutthaya, so there's nearly always a bit of a crowd around it! There is a small rope to fence the area around the roots off, I assume to stop people from touching or ruining it and there's also a sign that says you must not stand above the Buddha head, so if your getting your photo taken with it you have to crouch down on your knees, as a mark of respect. The ruins of Ayutthaya are amazing to explore, there are so many statues, either intact or in pieces, that speak volumes about the history of this ancient city. It amazed us both how modern life has just sprung up around the old ruins. Across the street from the temples are shops, restaurants and guesthouses, which just goes to show how life moves on and places adapt to new times! It reminded me of Rome, and how, on our first day there last March, David and I were just walking down the street exploring our immediate surroundings when we literally stumbled on the Colosseum! The massive ruins just keep there place while new, modern life builds up around them! One of the last places we visited, before I died of sheer exhaustion as we got lost on our way home, was this amazing Reclining Buddha. It is huge! 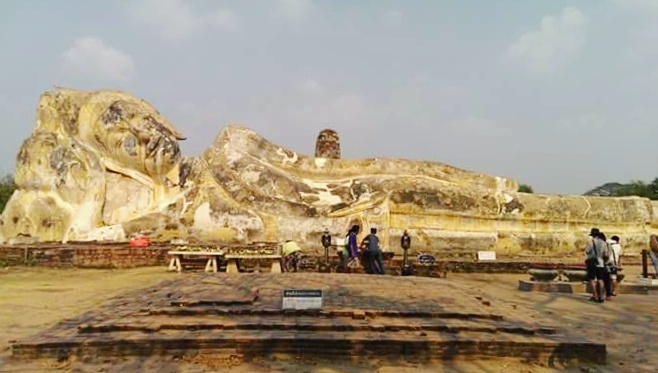 At 37 meters long and 8 meters high, it is the largest Reclining Buddha in the area, and it looks amazingly well preserved. It is covered in flowers and offerings, so I think it is still incredibly revered by many people. The only real downside of our time in Ayutthaya was seeing people ride elephants for the first time with my own eyes. It completely broke my heart to see such beautiful, majestic creatures draped in chains, and trooping up and down the same stretch of road over and over again, as tourists paid for the chance to ride atop their backs. We stood for a moment, watching 10-15 elephants make the same journey, stepping out onto crazy busy roads, their mahouts just presuming that the traffic will stop or move out of the way. 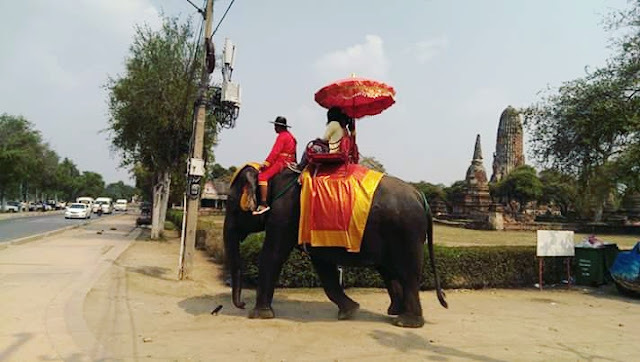 I don't know why people still pay to ride elephants when there is so much information and awareness about how terrible and dangerous it is for them, both the elephant and the people riding them! It is no life for such a wonderful animal to lead, and witnessing it just made me even more glad that we decided to support Elephant Nature Park, who work with the Save The Elephants foundation to rescue and rehabilitate abused elephants! 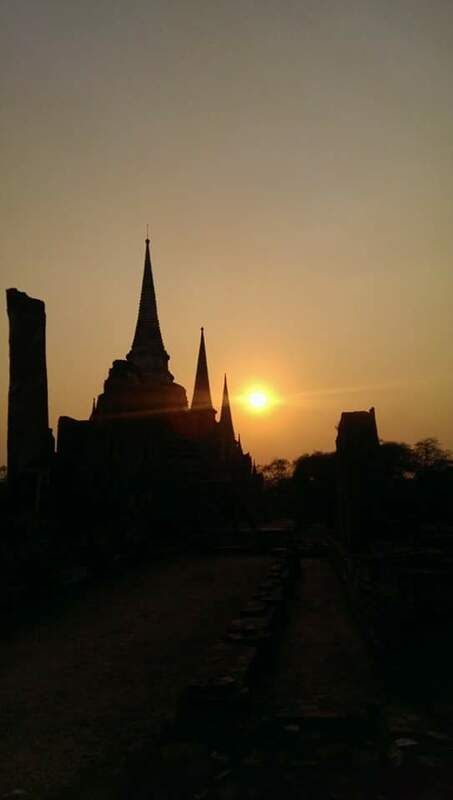 Besides that one pretty big downfall, Ayutthaya was amazing! Spending a couple of days there is definitely, in my opinion, better than coming on a day trip! You have so much more freedom to explore at your own pace, see what you want to see and then move on, there are none of the restrictions of time limits or missed out ruins. I think for both of us, the ruins of Ayutthaya are up there with our absolute favourite moments of our travels. It helps that we managed to time ourselves well, somehow we were able to avoid the big tour groups and pretty much have the ruins to ourselves, most of the time! Next up: Lopburi & The Monkey Temple!